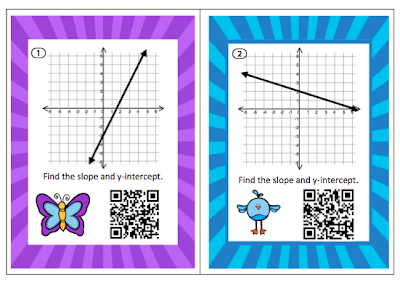 I think QR Codes can be very valuable in a high school classroom. So, I decided to try creating my own activity using QR Codes. 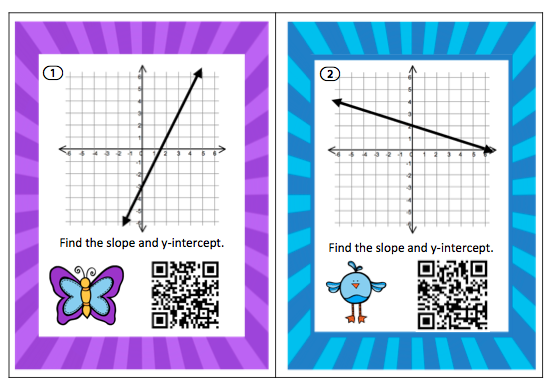 For this first activity, I am going to have students scan a QR Code when they would like to check the answers to the task card. I realize that students could just scan the code and get the answers, but they could also just turn to the back of their book to get the answers too! I am hoping that the novelty of using the iPad/iPhone/other mobile device will be enough to get them to try to do the problem first! I know nothing about QR Codes really, except that you see them everywhere, and I know I have an app for that! So, I am learning about how to use them in the classroom. So far, I have discovered that I can embed text, video, or a url into the QR Code. What I am struggling with right now is how I can give students answers to questions that need mathematical notation. For example, I know I could type sqrt 2 to mean the square root of 2, but it's not good math notation, and I want my students to use good notation! So, I am trying to figure out where I can store my QR Codes so students can get them. I am open to any suggestions that you might have - leave them in the comments section. Here are what two of my task cards look like. I am really excited about this new method of helping students learn with technology! Success in Secondary Linky Party! It is time once again for a Success in Secondary Linky Party! Please feel free to link up to three items (two paid and one free) that are appropriate for either middle or secondary school. As we all know, it is the time of year when students need things to do constantly to keep them engaged...preferably fun things! So, I created this maze for students to use to practice solving equations. These equations are perfect for students who are just starting algebra or pre-algebra. There are two mazes - in the first maze, students only need to know how to solve one step equations. In the second maze, students need to be able to solve two-step equations. In both mazes, students need to be able to work with simple fractions. I'd love for you to download it and leave feedback if you'd like in my TPT store or in the comments section here. In my geometry class, we are working on area. 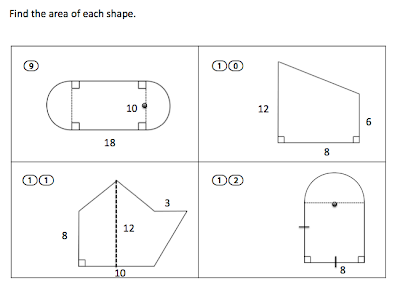 Here are some geometry worksheets and activities that I think would be great for you and your class to use. 1. 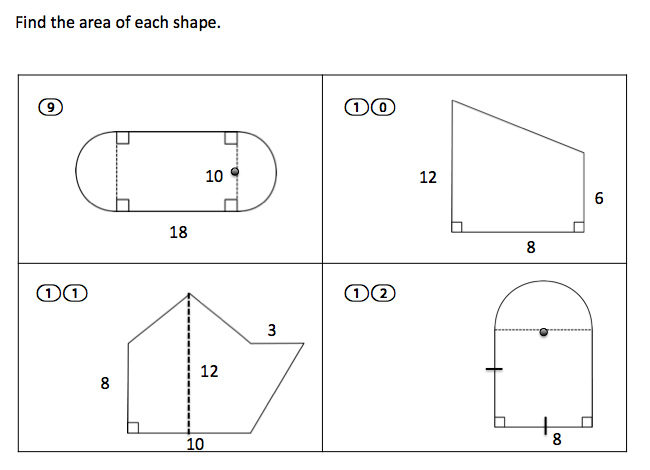 Shady Area Partner Paper - This is a really nicely designed worksheet that should help students work on problems where part of the figure is shaded and part is unshaded. Students really have a hard time with these! 2. 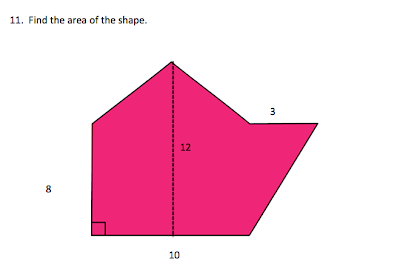 Area of Triangles Scavenger Hunt - This looks like a fun activity. I love that it gives students some more difficult problems to work - I mean how many times can you multiply two numbers together and then divide by 2 : ) It also gets students up and moving around the room - fabulous! 3. Circle Search - Area Edition - Here is a fun game to help students work on finding the area of a circle. Non-metric units are used. 4. Approximating the Area of a Circle Using Rectangles - Love this idea as an extension in an honors class. A great thing to refer back to if you teach the students again in calculus like I do! Not too difficult, but a great tie-in to the rectangular approximation method used in calculus to estimate the area under a curve. Best of all, it's FREE! In this product, students are given a worksheet with four problems per page. There are additional sheets that have one problem on the page which the teacher can project - the students can follow along on their own worksheet. Now that Spring Break has come and (almost) gone, we need to start winding back up to get through to the end of the school year. What could be better than challenging your students with a new idea, new worksheet, or new game? Link here with your product, blogpost, or activity. Leave some comments if you love something that you have found! I have lots of questions concerning iBooks author. As I mentioned previously, my school is thinking of having students purchase their own iPad and then using one for all of their classes. It is definitely not a done deal - there are lots and lots of issues to address. Specifically, let's focus on geometry for an example. I would like to write my own iBook so that my students no longer have to purchase a textbook. I would like to use iBooks Author to make my book, so students can obtain the book through iTunesU or through the iBookstore, however that is going to work. But, the big question that is at hand...what can I legally put in my book? We currently use the book Geometry for Enjoyment and Challenge which I love. I'd like to be able to use problems from that book in my book...is that fair use? I'd like to be able to use various Texas Instruments explorations that students could download to their calculator. Can I put those in my book, can I link to them, What??? Since the kids will have basically a computer in their hand, is it ok for me to link to youtube videos to show them a cool thing that other kids did for pi day? Can I embed the actual video? I welcome your comments on this post. Stay tuned for answers that I find to these questions.